State of the art dual function meters with two environmental sensors housed in a remote wand. The sensors can be placed right where they are needed. Both meters feature triple LCD displays, RH and temperature readings simultaneously, and a second K type thermocouple port. 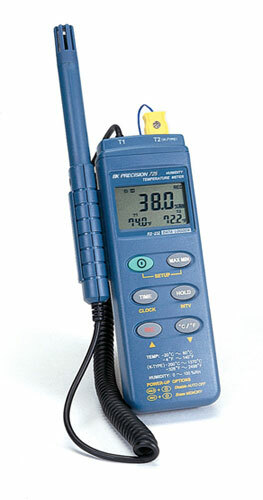 The model 725 has data logging feature and records up to 16,300 data points. With an adjustable interval setting, you can record from 4 hours to 678 days worth of data. This model features an RS232 output port and comes with interface software and cable so you can either download data for analysis or control the meter in real-time from your PC.